Sarah Buchanan didn't grow up on a farm. She didn't study agriculture at her university, Georgia State, and until a few years ago, the only plant she may have envisioned herself cultivating was basil. But a little girl in a blue sweater would change all of that. "My passion was kids," explains the 28-year-old co-founder of Kula Project, a non-profit organization that invests in struggling small-scale farmers in developing nations. In 2009, while on a trip to Kenya, Buchanan first encountered the 18-month-old in the blue sweater. One year later, Buchanan would return to Kenya and find that same little girl still wearing that same little blue sweater. As Buchanan writes on Kula Project's blog, "Normally, a one-and-a-half-year-old child will grow out of her sweater in the same season, much less still be able to wear it a year later." But that region of Kenya, she would learn, was suffering from a drought and as a result the farmers had lost their crops. Without any means of income or food, the children were starving, and the little girl's stunted growth was due to malnutrition. "I knew that the only way to help the kids was to help the parents," Buchanan says. Determined to learn more about the poverty and food insecurity that she witnessed, Buchanan returned to Atlanta and switched her major from pre-law to international development, taking courses in African politics and economic development. Then in 2012, she teamed up with James Sasson to co-found Kula Project. With a goal of creating sustainable communities, Kula -- which means "to eat" in Swahili -- currently works with farmers in Rwanda. Under Kula, each farmer has a fundraising goal of $3000. The $3000 buys up to 500 coffee trees -- Rwanda's main cash crop -- as well as up to 250 banana trees, and a supply of mulch and fertilizer that will last up to three years. Additionally, the inter-cropping coffee and banana trees will eventually generate their own mulch, something that is usually acquired by cutting down local trees, a detrimental action that leads to rising temperatures and a lack of rainfall. The banana trees will also provide protection for the coffee trees from the high temperatures. In other words, as Buchanan says, "For $3,000 we can double a family's income for 30 years." Part of sustaining that income is ensuring that there is a demand for the farmer's crops. "If there isn't a demand for what these farmers grow then we're wasting a lot of time and money." 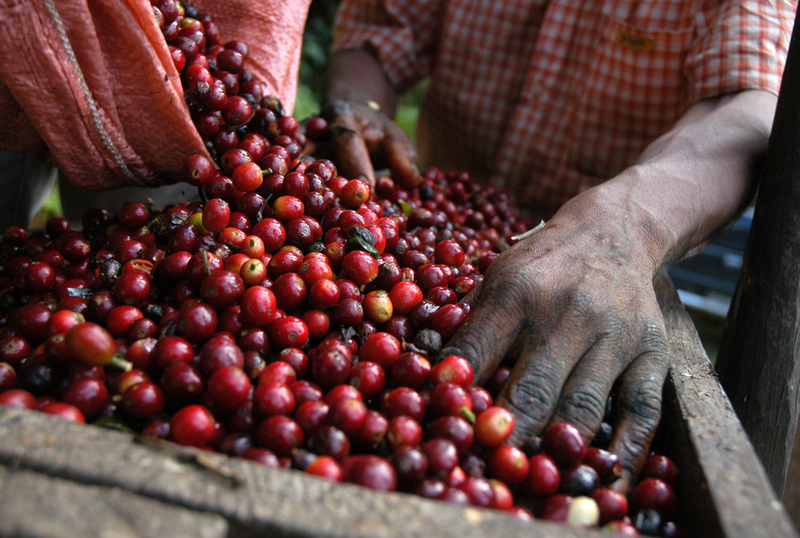 To guarantee access to a fair-trade market, Kula partnered with Land of a Thousand Hills Coffee Company. Through the partnership, Kula also hired Manu Gatare and other local experts in Rwanda to manage the agricultural aspects, including addressing the challenges of facing each farmer, outlining solutions and, most importantly, finding the farmers who are in the greatest need.Farmers like Jean, who would like to expand his family's farm so that they can afford to have electricity in their home. Or farmers like Gertrude or Maria, both survivors of the 1994 Rwandan genocide, who, like so many, hope to send their children to school with the additional income they make from their farms. Kula stays with the farmers for approximately five years. It's a solid length of time, one that reminds us of how Mother Nature moves at her own pace. After nearly a year of working with the farmers to develop a program that meets their needs, the coffee trees are planted in early November, after which they won't produce for three years. "It teaches you patience," says Buchanan. "You really can't point to your success for a while. Real change takes time." However, that time has posed fundraising and marketing challenges. "We don't have any instant gratification that the donors really like to see." Events, such as their annual #ForTheFarmer campaign as well as the Kula market, which sells jewelry, t-shirts, and, of course, coffee help with some of those challenges. Something that hasn't been a challenge for the non-profit is working in Rwanda. "Our Rwandan staff and our farmers are the most incredible people," Buchanan says. "I expected developing the [agricultural] programs and working in a foreign country to be the hardest part, and that's the easiest." Buchanan credits the farmers for their input and contribution of ideas that help make Kula's job easy and enjoyable. Though Buchanan has had a heart for Africa since that first trip to Kenya in 2009, it was Rwanda that really struck a chord with the Atlanta native, who used to tell people that she often felt homesick for place that she didn't even know existed. Then came the day she went to Rwanda. "I was like, this is the place," Buchanan recalls. "This is where I'm supposed to be." Buchanan divides her time between Rwanda and Atlanta. When she's not in Rwanda she keeps photographs of the people she works with all over her home office to help her get through the long hours, waves of emotion, and criticisms that come in directing a non-profit. "When I do get tired or upset I can just look up and see them," she says. As for the inspirational little girl in the blue sweater, Buchanan says she hasn't been back to that region of Kenya but hopes to visit soon as she thinks of the little girl daily. "I have her [photograph] in four different rooms of my house!" The Story of Kula Project from Kula Project on Vimeo.